From I40 on the south to the Mojave National Preserve’s campgrounds the road is paved up to the Hole in the Wall campground and off to California’s Providence Mountain State Recreation Area and Mitchell Caverns. This is the east side of the preserve and the center for those into hiking the trails and taking off in an ATV. The holes in the wall nomenclature refers to the erosion in the rock walls in the buttes and canyons. There is a visitor center to help you figure out what is nifty to look at, too. 1/18/57 – Durango – arrive 8:30 on 1/18 left at 9:00 on 1/20 – weather on arrival, very cloudy and some wind. Not such a good campground – supposed to have light and water for each trailer. We were told this in Mexico – don’t take anything for granted-some didn’t have water but we did have lights after we went to bed. Same band and mariachis. Durnago was a large cattle country but due to lack of rain the people are having a hard time to promote other industries.Large lumber mill here and a mountain of iron 65% iron. Took a bus tour to the mountain – really a sight but no coal no oil transportation bad but they eventually will work out something. Cloudy but only occasional rain – very dusty in campgrounds. Visited town in pm. much cleander than Parral but most streets are very narrow – one way – no entertainment tonight – leave tomorrow 1/20 for Zacatecas – 8am – beautiful country – quite a bit of farming – reservoirs in every place there is a chance to catch water. They could sure raise most anything here if they had the water. They whole countryside so far is the land of mesquite and pricly pear cactus – big trees of prickly pear cactus. 1/20/57 – arrive 8:20 pm in Zacatecas – weather beautiful-little cool. Parked on street in center of town – nice trip – stopped for lunch on Tropic of Cancer. Arrived late in Zacatecas parked on street. Mining is main industry here – old viaduct on entering town. Park very beautiful. Town is very old – crooked streets and narrow. Nice program outlined. Band concert – mariachis on arrival at 6pm. Reception at governor’s palace – very impressive – refreshments served – Indian dances at 7pm in plaza at campsite – dinner with three other couples at Hotel Ruiz – no more food and regular dinner very poor – ran out of most food before serving us – over 2 ½ hours for our supper. 1/21/57 – At Zacatecas – weather good – took shopping tour of town on foot – too tired to take in any more events – bull ring festival – dance at casino – Aguas Calientos tomorrow at 8am – market place at Zacatecas really something – unable to find any nice stores. JB and Jo Harrison Travel Diaries is a new category on Zephyrs. Bryan (JB) Harrison kept a diary of his travels with WBCCI caravans and other travels. We’ll post excerpts here as if he were using a blog rather than a notebook. The travels cover the period from about 1954 up through the sixties. The areas toured include Mexico, the United States, and Canada. 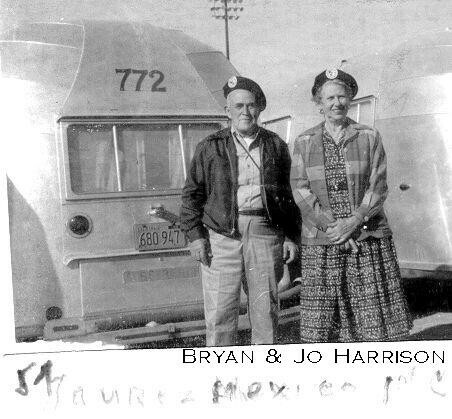 For more about the Harrisons and for photo galleries of the pictures they took on their travel, see the memories and travelogues page on the website: Jo and Bryan Harrison WBCCI #772. Some things have stayed the same and some have changed. 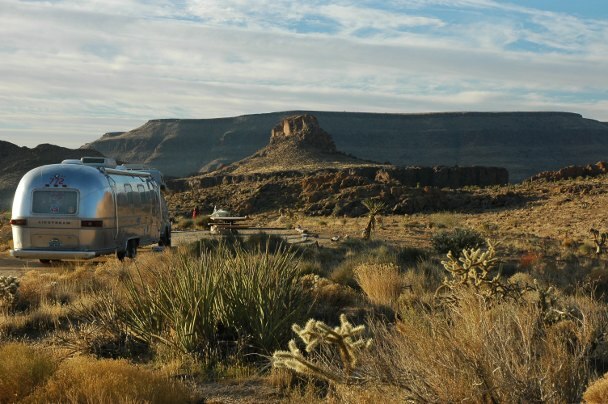 These diaries record the early days of the modern RV experience in North America. The train was more concerned about grades than water in crossing the desert so the routes used by travelers on foot and in wagons was often different from that chosen for the railroad. 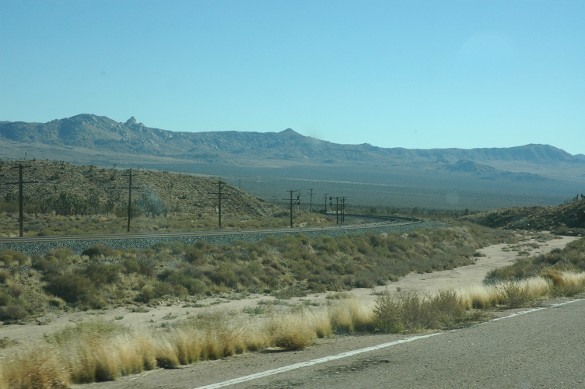 East of Cima, the rail went around the hills while the old Mojave Road went over them. The 2000′ drop to Kelso to the west and 1000′ foot drop to Nipton to the east from the Kelso Summit at Cima still needed some extra power, which was handled at the Kelso depot. The Mid Hills and Providence Mountains occupy the middle of the Preserve. From Cima to Kelso and the Kelbaker road to I40 back up to Hole in the Wall from the Essex exit is all paved. The northern part of the loop is gravel. The area is criss-crossed with rough trails. Most of the area is open to dispersed camping. 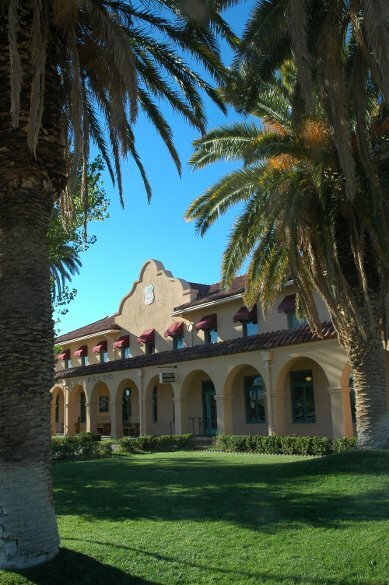 For more on the history of the roads and rails in this area, see the links in the previous post, The two mission revival style RR depots: Kelso and Caliente. These two train depots are the only Mission Revival Style railway depots on the West coast. They were both built by the Los Angeles and Salt Lake Railroad which later became the Union Pacific Railroad along remote parts of the Salt Lake City to Los Angeles route. They heyday for these depots was pre WWII. Modern railroad engines and procedures eliminated much of the need for these service stops. The desert is a place most just want to cross. When it takes a few days travel, water becomes an issue. Control over resources and routes become focused and that makes for some interesting history. 1/16/57 – At chihuahua – mileage 796.6 – weather cludy and cool – up at 8 – meeting time 9am – bus tour of the city at 10:30 – visited the university, the president’s palace and Hidalgo Plaza, the theater with murals on the wall, a lecture on the history of Mexico and a tour conducted by a small Mexican from the Chamber of Commerce. Then we were taken for a free meal – all the beer you could drink and wonderful entertainment – state band and mariachi’s – two very small mexican dancers – Walked home with our neighbors about two miles – very tired. Chihuahua is a very nice city – very progressive – university is new and very modern – amazing what these people down here are doing – sure are trying to do everything to make our visit complete – we are not tourists to them, but are visitors – the city is ours – very wonderful. Campfire and singing tonight – to bed early – leave for Parral in the morning sometime after 8am. 1/17/57 – left at 8am -beautiful cattle in country from Juarez to Chihuahua but need rain more than we do in California. Arrive 3pm Parral milage 974.4 – weather cold – little clouds very cold – lots of Mexican kids. Old mining town – very crooked streets – our campground grand as usual. Band and mariachis to greet us – no time for sight seeing – too cold to go any place. Up at 6am left at 8:05 for Durango – 286 miles – so? trip bad roads lots of grades, before arriving in Durange had to detour for about six miles and two mean detours, Have never driven a car and trailer over anything as bad as we did today – very dusty. Gassed up at Zecas and ran out of gas within one block of the campground at Durango – borrowed gas from the Norths to make it into camp – very tired. No time to visit at Parral – street too narrow and crooked – a large smelter situated on a hill opposite campground – very cold – surrounded by rolling countryside – this is the land of cactus ans mesquite but beautiful cattle country – that is if they could only get rain. 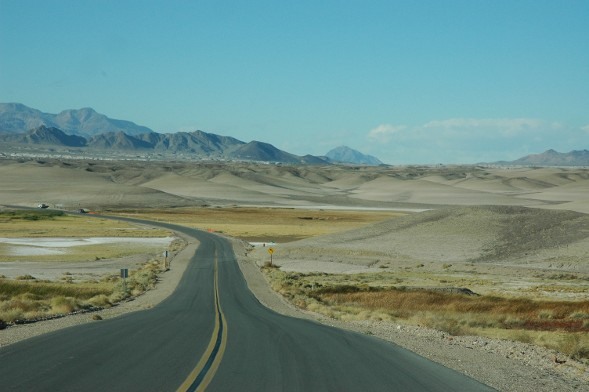 CA127 from Shoshone to Baker is the transition from Death Valley to the Mojave Desert. Near the Dumont Dunes the mostly invisible Amargosa River turns around the Black Mountains to head back towards the north and terminate at Death Valley’s Badwater Basin, the lowest spot in the continental United States at 282 feet below sea level. To the west of CA127, on the other side of the Avawatz Mountains, is the Fort Irwin National Training Center and the Goldstone Deep Space Tracking Station – restricted access areas. 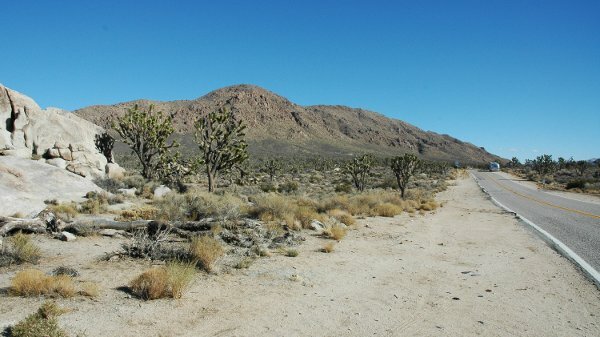 The Mojave National Preserve is south of Baker. This tour takes the Cima road towards the Cima Dome and Volcanic Field National Natural Landmark. There is a trailhead between Teutonia and Kessler peaks to help guide you towards a better view of the landmark. The Cima road meets the railroad at Cima at the top end of a 2000′ drop in elevation over 15 miles to Kelso. That’s for another time. Drop out of Death Valley to the south and you encounter the Amargosa River valley and the old Spanish Trail. 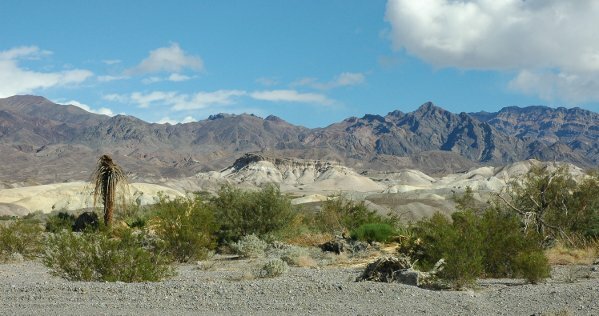 Shoshone and Tecopa provide a desert oasis here known mostly for the hot springs, There are also some BLM LTA places for those seeking an alternative to wintering over in Quartzsite. 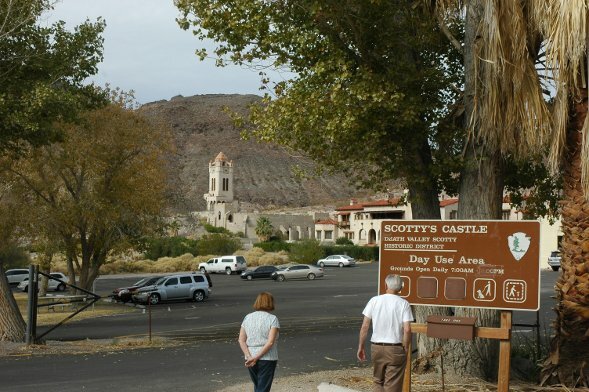 It can also be a spot to catch up on things after a Death Valley visit – if you are careful to make sure you have potable water and waste facilities available and don’t expect to communicate with the outside world. An Escapees discussion noted the Hevpo P-trap for RV use. The P-trap is one of the hallmark inventions in plumbing that uses a droop of pipe to trap water so that sewer gases cannot back up through the drain and smell up the place. In RV’s, these P-traps take up a lot of space, dry out when the RV is in storage, slosh out in rough travels, and freeze in winter. Poor P-trap function couple with poor tank venting is a major reason why some folks are desperate for holding tank chemicals to sweeten the smell of their RV. The Hepvo Waterless RV Valve costs about $25 and is a chunk of pipe (1.25 or 1.5 inch diameter) that has a one way valve in it. Don, on the Casita forum has a picture that shows what kind of valve it is. That discussion also has some other good pictures of an install as well as some links to yet more pictures. Codes are also an issue. Hepvo indicates that they have worked with ASME to develop a standard for waterless P-traps to help in that area. Waterless urinals are another application that put pressure on local code authorities as well. Some RV manufacturers are using the Hepvo so they can lower the floor of their showers or provide a storage drawer under the sink. A P-trap like this might be something to consider if you get into plumbing maintenance with the drains. It’s a desert hideaway in a canyon at the north end of Death Valley — or maybe a lesson in what happens when your dreams exceed your capabilities and the park service ends up with them. You can tour the inside for an additional fee and get commentary from docents dressed in period costume. These pictures are from the outside where the only fee is the entrance fee you are supposed to pay when you touch the park service territory. Now, if we could figure out if it’s “Scotty’s” or “Scotties” and has images of miners or minors on the wind vane. It would be interesting to find out more about the engineering here, especially of the ‘unfinished’ waterworks. It appears that the place was intended to be pretty much self sustaining – a survivalist’s bug-out destination big enough for the whole tribe. The bypass is 5.5 miles with nine new bridges, twice as many lanes as before, and a higher speed limit. What it does is to make the crossing of the Colorado on US 93 a non event where it is difficult to even tell it exists. Northbound high profile traffic is directed to the inside lanes, perhaps to avoid interference with the pedestrians on the north side of the bridge although the very high berms helps keep traffic segregated (and visibility off the bridge down). It isn’t scenic if you are looking for bridge, canyon, or dam views. If you want to see the dam or the bridge, you have to hit the old road going down to the dam from the Nevada side. That will give you some idea of what the road was like before the bypass, too. The Arizona side was the real ‘winding down through the canyon’ road experience and it is now no more than a memory. Now what you’ve got is near freeway conditions from the Nevada casino intersection near the dam all the way down to Kingman. That’s needed as both ends have severe traffic problems yet to be resolved. See the photo gallery of a Death Valley Tour! The photographs were taken in mid November 2010. These are excerpts from JB and Jo Harrisons travel logs. 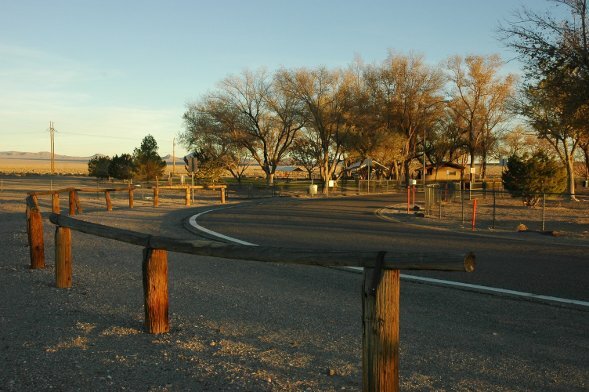 1/10/1957 – Arrived at Rancho Grande Tralier Park in El Paso. Made connections with the caravan. Leave for Juarez Saturday 1/12/67. On Friday we went to see Florence (a relative) She gave us a bunch of canned goods, some fruit cake and pecans which we appreciated very much. We went back to the trailer just before noon. Got ready and came on down to Juarez and were very glad we didn’t wait until today as they were running out of space in the ball park and some of them had to park outside in the street. They have quite a lot of meetings today. We registered, got our Berets, indentification cards, tended to our insurance and are almost ready to go. I am cooking supper so as to get it over with before dark. 1/15/57 – Left Juarez at 8:10 – caravan started leaving at 8 sharp – weather fine but a little chilly – what a sight after we all got strung out on the highway – over 200 trailers – have to be seen to believe – met up with our neighbors Mr. and Mrs, North from Missouri and Mr and Mrs Luckenot from Washington. Back to Juarez for a few highlights “The Bouquet” needs some mention – our introduction to the land of manana – soup cold, beer removed after soup – shrimp cocktails – ran short of preserved fruit – instead, by time turkey was served, at our table everything began to run short – I doubt if some of the people got anything to eat. The floor show was something – the picked up out of one of the dives in Juarez – but all in all we had a banquet – now back on the road to Chihuaua – the road is narrown and had shoulders. We were traveling too fast so three of us decided to travel together and drive slower – stopped for lunch about 10am – arrived in Chihuahua about 3:30 pm – all three of us parked together. State band here to greet us and a mariachi band to entertain – spent the evening sitting out in front of our trailer with our neighbors and enjoying the new moon – very beautiful. If you’re in the four or five hour travel day schedule and heading south from Reno down central Nevada on US 95, then Tonopah is a likely target for an overnight. You can hit the RV park there or the Casino parking lot if you need the amenities. 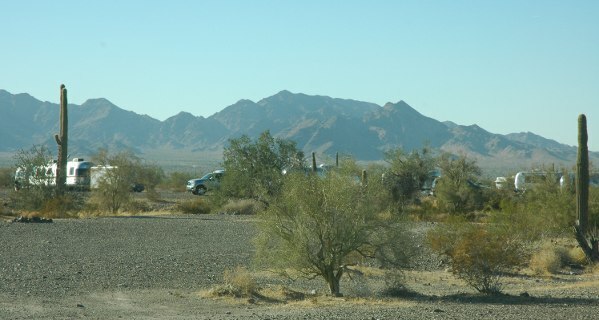 If all you need, though, is a convenient place to park, Millers roadside rest area just north of Tonopah a few miles, might work. The place was a railroad pit stop during the first half of the twentieth century and named after a railroad executive. Now it is an electrical power substation, a roadside rest area, and a few remnants. This particular rest area is off limits to commercial truckers but has flush toilets, a (seasonal) dump station, and a large gravel lot with plenty of room for RV parking. You’ll see the trees marking the rest area from several miles up or down US 95 as it is out in the flats all by itself. GPS coordinates will help you find it: 38.140264 north latitude, -117.453729 west longitude. A Thanksgiving rally, the WBCCI Four Corners Unit at winter RV central among the saguaro and mesquite. The pebbles over much of the ground are not kind to the dogs. The December 2010 Newsletter has been posted. Links to photo galleries and additional information mentioned in articles in this newsletter can also be found at there, too. Not too late to rsvp! Wheels & Doris Wheeler are the hosts for the December SNU luncheon. This will be Saturday December 11, 2010 at J.T.’s Basque restaurant at 11:30 am. J.T.’s is on Hwy 395 south of downtown Gardnerville. The lunch is $15 person. To RSVP contact the SNU via email hq@sierranevadaairstreams.org or phone: 772 972 5011. Note: the Region 12 Rally Report was written by Frank Colligan. Thank you Frank! Our guests at the Death Valley rally from the Oregon Unit, Paul and Pat Buescher, wrote a nice blurb about the SNU for their Unit newsletter. Check it out on the SNU newsletter links page.